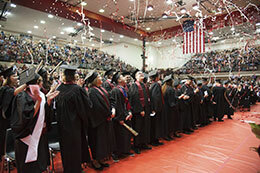 IU East graduates celebrate during the 2014 Commencement Ceremony, held at the Richmond High School Tiernan Center. Indiana University East will host its 44th Commencement Ceremony at 6 p.m. on Friday, May 15, at the Richmond High School Tiernan Center. Indiana University East has completed its transition to a full-fledged baccalaureate and master’s degree institution. During the 40th Commencement Ceremony held in May, the university conferred its final three associate degrees. 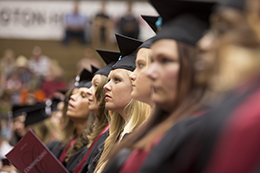 The pinning ceremony for Indiana University East nursing graduates begins at 2:30 p.m. with a slide show and the ceremony at 3 p.m. on Friday, May 13. The annual ceremony for nursing students will be held at the Central United Methodist Church, located at 1425 E. Main Street in Richmond. Nearly 400 degrees will be conferred at the 40th Indiana University East Commencement Ceremony on Friday, May 13. Commencement begins at 6 p.m. in the Tiernan Center at Richmond High School. Indiana University East will offer Bachelor of Science in Political Science and Bachelor of Science in Sociology degrees beginning this summer 2011. Currently, students interested in majoring in political science or sociology are enrolled in the Bachelor of Science in Behavioral and Social Sciences with a concentration in political science or sociology. Indiana University East will award its 200th degree for the Bachelor of Science in Business Administration program in Lawrenceburg to December graduates. Seventeen students will have their degrees conferred. IU East and Ivy Tech Community College of Indiana Southeast in Lawrenceburg formed a partnership in June 2004 to offer the business administration degree program as well as the RN to BSN (Bachelor of Science in Nursing), Bachelor of Science in Elementary Education and Bachelor of Science in Communication Studies completion programs. Also offered at the same site is a Master of Science in Education. The innovative partnership provides educational opportunities for residents in southeast Indiana, improving the quality of the workforce for the region. The Indiana University East School of Natural Science and Mathematics is seeking approval from the Indiana Commission for Higher Education for two new degree programs. The Bachelor of Science in Human Life Science and a Bachelor of Science in Biochemistry degree programs received prior approval from the Indiana University Board of Trustees during its October 1 meeting. 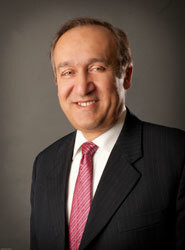 Both degrees could begin in fall 2011 pending approval from the commission. Indiana University East is pursuing its fourth master’s degree program in one of the nation’s growing career fields. The Master of Science in Nursing degree was approved by the Indiana University Board of Trustees during its October 1 meeting. By receiving the trustees’ approval, IU East may now submit the graduate program to the Indiana Commission for Higher Education and the Higher Learning Commission of the North Central Association for their approvals. Indiana University East is now offering an online degree completion program for a Bachelor of Arts in mathematics. Currently, three bachelor degree completion programs are offered online including Business Administration, Communication Studies, and English-Technical and Professional Writing.